This Second Floor Gardenia model condo has 2 Bedroom 2 Bath with spacious vaulted ceilings with an open floor plan view from the kitchen in to the living area. It is is excellent condition and the Master Queen Size Bedroom also has flat screen TV, second bedroom is a Queen also with its own flat screen TV, FREE WIFI.. This unit offers a great water view from your screened lanai. Beautiful Florida sunrises! Colonial Country Club features a championship golf course, a full service clubhouse and recreation complex. The clubhouse has a dining room, a grill-room, a snack bar, fitness center, a library, meeting room, massage rooms, golf pro shop and activity center with a full time director. Colonial has eight lighted Har-Tru and two hard surface courts. The 18-hole championship golf course was designed by Gordon Lewis with an aquatic driving range and putting green. 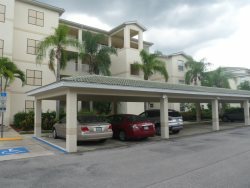 Colonial Country Club is conveniently located off Colonial Boulevard, an east-west thoroughfare near Interstate 75. Perfect getaway as it is close to airport, malls, Red Sox & Twins training camps, & restaurants. Amenities includes golf, 10 tennis courts, state of the art fitness, pickle ball, bocce ball, 7 community pools, restaurant with weekly entertainment in the sports bar, library, community room, nature trails, and sidewalks. Full of activities for everyone. This building is close to one of the main community pool and pickle ball courts. Come and live the Country Club lifestyle in one of the friendliest communities around!